Our rectangular, fiber-based cartons are as elegantly functional as they are environmentally sustainable. Our cartons are made from environmentally friendly paper a renewable resource that produces minimal environmental impact. It’s packaging that delivers significant benefits across the value chain. The recyclable square shape makes our cartons easy to transport. In fact, you get 18% more filled packages on a pallet compared to traditional cans. 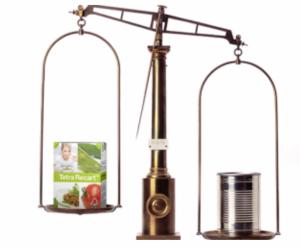 IPM Food’s cartons are tough but very lightweight; on average weighing a third less than a can. That can pack a big punch when it comes to tons in resources, carbon emissions and transportation. The package is made primarily of wood fiber, a natural and renewable raw material. It’s comprised of 100% FSC certified fiber procured from responsible forest management and other controlled sources and endorsed by global environmental organizations. These packages are also easy to flatten and are recyclable, so they can be turned into new, useful products when empty.